It’s been a while since my last Pattern Radar post. These are semi-regular posts in which I highlight patterns which have caught my attention. Normally, when I write one of these, my “favorites” box is overfilling with new and interesting patterns; this time not so much. In any case, here are the ones that have lately caught my eye. Combined with the lovely green (I am a sucker for green), this one definitely sparked my interest. I think this would look fabulous on a very shapely person, and would also impart a beautiful silhouette to a slim, willowy person. I like the ease of it, and can imagine wearing it in a pale shimmery silky grey, on a breezy summer evening, while sipping prosecco. Called Oxidar, you can find it here. I must be really attracted to this kind of shaping with ribbing; you can see it in the lovely Audrey which I knit for my daughter Emma, and also in the shapings of the ribbing for my Escher cardigan. I think this example is very sophisticated but also casual and fun at the same time. I would even overcome my zipper trepidation to knit this pullover. It really has a casual chic vibe to it. 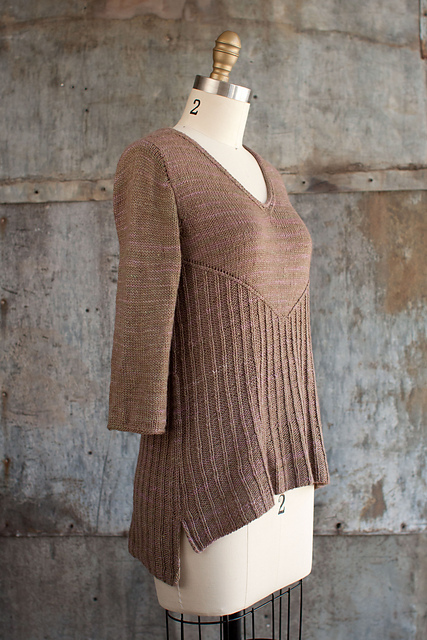 It is called Ella, and is designed by Lene Holme Samsøe and published in Perfectly Feminine Knits. I have some very pretty grey silk merino blend yarn in my stash that would work really well for this. I am considering knitting up a swatch and seeing if Emma is interested. This is another example of casual chic, with good details and classic lines. 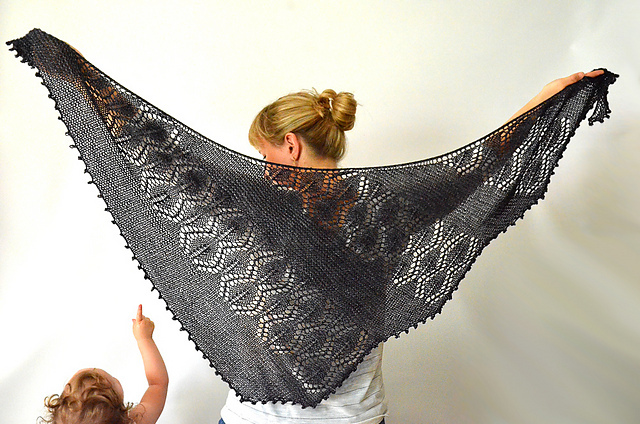 The pattern is called Seiklus Shawlette and it is designed by Justyna Lorkowska. 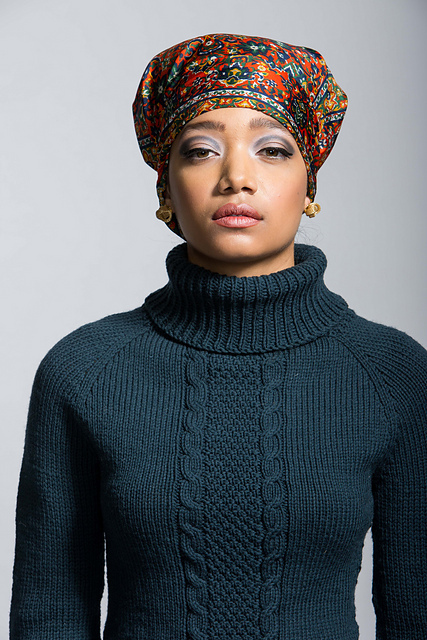 It is pretty irresistable in this grey and would also be lovely in black (though it would take a brave knitter – or one with much younger eyes – to knit this in black). 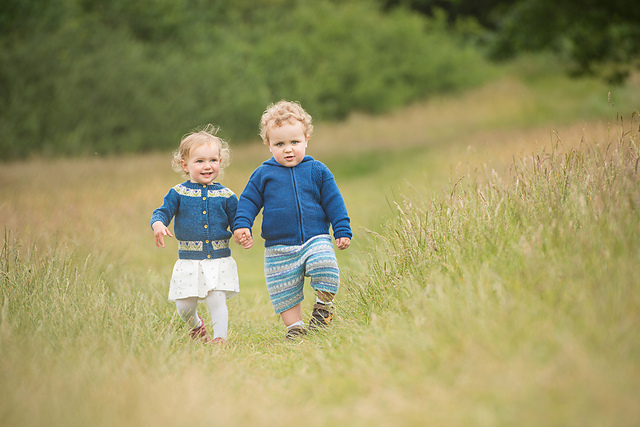 And while we are on the topic of kids, Kate Davies and Jen Arnall-Culliford recently released some down-sized versions of their adult sweaters, Bluebells and Bruton. 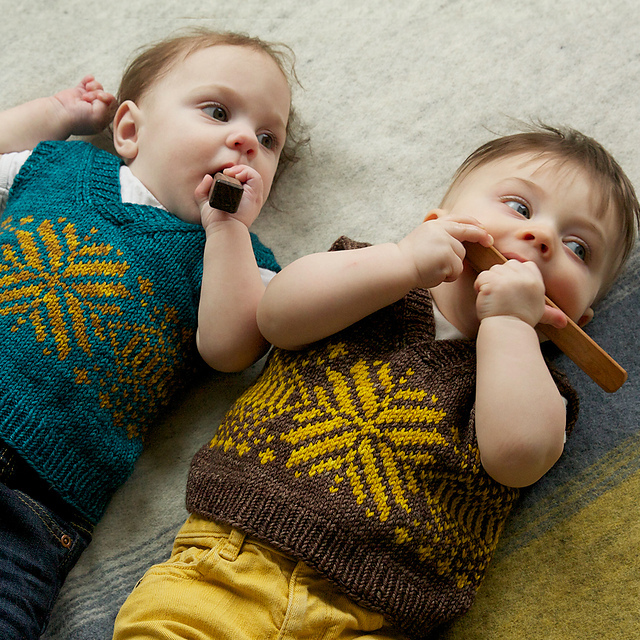 Called Wee Bluebells and Wee Bruton, they can be found in Cross Country Knitting, Volume Two. For some wonderful photos, and close-ups of the sweaters themselves, I recommend you read Kate’s post (actually, I recommend you read all of Kate’s posts – I never miss one). That’s it for this edition of Pattern Radar. Happy knitting, everyone!